Product prices and availability are accurate as of 2019-04-19 09:05:07 CDT and are subject to change. Any price and availability information displayed on http://www.amazon.com/ at the time of purchase will apply to the purchase of this product. Why Are You Choosing Our Seamless Wirefree Bra? If you're looking for a bra that's comfortable enough for sleep and leisure time, but still provides a fair amount of support to get you through the day, this seamless bra might just be the right bra for you! This women bra gives you the seamless and wireless comfort you've always dreamed of. All of our seamless wirefree bras are designed to hug you to provide a snug fit. However, if you prefer a more relaxed fit, then choose the next size up. This seamless wirefree bra is suitable for everyday wear or for workouts. It's great bra to relax in after your work day or for yoga, sports bra. You are always in control, no matter what you are doing. Package include: 3 Pack of Women Seamless Bra. This women bra is a great sports bra and every day bra. The 3 pack women bra is breathable and comfortable, smooth and stretchy. Easy to slip in, form fitting seamless construction with soft contour cups. Women Seamles Wirefree Bra with Removable Pads. Seamless design to minimize chafing,while 4 way stretch to maximize comfort. No wires, clips, hooks or straps to adjust. And removable cups for enhanced shape and coverage. The wide straps are made to sit comfortable and will not cut or dig into your shoulders. And the wide bottom band prevents the seamless wirefree bra from riding up even during your workouts. Our seamless wirefree bra is ideal for everyday wear. It not only makes agreat leisure or sleep bra, but also suitable for yoga bra, sports bra and dance bra. Great to wear under pajamas, lounge wear or yoga clothes. 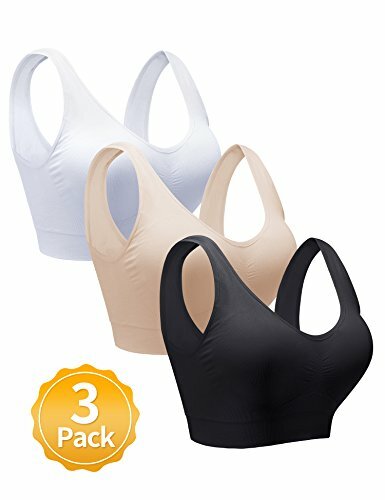 This women seamless bras are available as a 3-pack. They create a smooth appearence under your clothes and come in various sizes and colors. Hands wash only, Tumble dry low, Do not bleach, Do not iron.